Obituary for John Howard Grooms | Herald & Stewart Home-Funerals, Inc.
John Howard Grooms, widower of Aldean Moore Grooms, passed away Saturday, July 7, 2018. He was an 89 year old native of Montgomery County, born July 7, 1929, son of the late Robert Lee Grooms Sr. and Gladys Barnes Grooms, an Army veteran of the Korean Conflict, retired employee from A.O. Smith and a farmer, and member of the Pentecostal Church. He is survived by a daughter, Karen Grooms of Jeffersonville, 2 brothers, Robert (Elenora) Grooms Jr. of Jeffersonville and Cecil Morton Grooms of Mt. Sterling, and numerous nieces, nephews, family and friends. 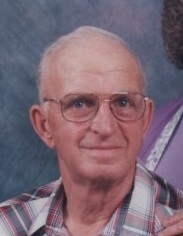 He was preceded in death by a son, Kevin Grooms, and 2 sisters, Flossie Caudill and Dorothy West. His funeral will be 1:00 Wednesday at Herald & Stewart Home for Funerals with burial in Machpelah Cemetery. Visitation will be 5-9:00 Tuesday.